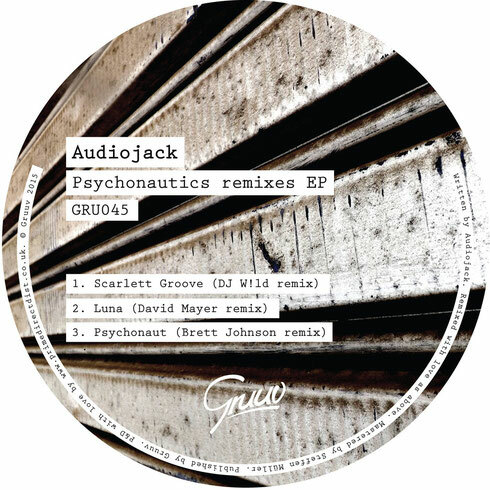 The Gruuv imprint delivers a remix package this Mondayfeaturing DJ W!ld, Brett Johnson and David Mayer interpretations of tracks from Audiojack’s recently released ‘Psychonautics’ EP. Just before Gruuv starts its run of 5 Years EPs the label delivers a remix package of Audiojack’s ‘Pscyhonautics’ EP which picked up support from the likes of Roman Fluegel, Dusky, Huxley and Loco Dice. Here the label enlist the talents of three electronic music producers, namely Catwash main man DJ W!ld, Keinemusik’s David Mayer and Classic’s Brett Johnson. The DJ W!ld take on ‘Scarlett Groove’ kicks things off and the French producer reshapes the original composition into a brooding eight minute workout built around upfront rhythms, snaking bass grooves and howling atmospherics. David Mayer’s take of ‘Luna’ follows and remoulds the original number into a bass led cut with sparse percussion bouncing around the infectious and protruding square wave bass hook. To close the package, Brett Johnson delivers his ‘Tech Workout’ remix of title track ‘Psychonaut and in typical fashion from Johnson you’re treated to bumpy drums, mindbending synth blips and a generally frenetic groove for a near nine minutes.